The late 1920s and early '30s were awash with fads and follies to engage the young and amuse their elders as the Jazz Age slid into the Great Depression. From flagpole-sitting to "dance derbies" or marathons, the manias that swept the nation periodically seized the headlines for a moment before they faded from view. Waco was not immune to such crazes. In July 1930, the Waco News-Tribune carried headlines about "Every Tree now Potential Bean Stalk for Jack" and "Police Officers out on the Limbs" seeking to remove from trees kids in such towns as Fort Worth and El Paso who hoped to set the tree-sitting record. They had been inspired by Jack Richards of Kansas City, who endured 156 hours — or more than six days — in a tree before he called it quits. 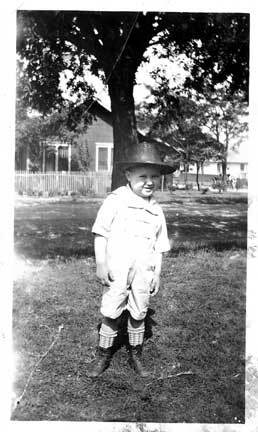 At 1 p.m. July 16, 1930, Frank Kellner Jr., 12, climbed the cottonwood tree in the backyard of his home, 2324 Homan Ave. — launching the craze in Waco. The News-Tribune reported that the youngster, a 94-pound Boy Scout who looked like he was "out to try anything for glory," had a support team made up of pals Sidney Carlisle, Keith Burns and Maynard G. Darden. The trio sent up three meals a day, made by Frank's enthusiastic mother, in a basket on a rope. Some even climbed up to his quilt-lined and book-laden platform to play a board game to help him while away the hours. Frank's father told reporters that he'd offered his son a $1 per day incentive for each day past the record Frank could make it. A day later, two female rivals took to the branches. Frances Coates, 11, and Mildred Fraser, 13, with a black and white kitten for company, climbed a tree at 502 Dallas St. and nestled among blankets and pillows stuffed in the crotches of a box elder. Their support team was composed of friends Mildred Yarbrough and Marie Stewart. And what did law enforcement make of all this? Waco Police Chief Hollis Barron told the News-Tribune, "If they've got that little sense, let 'em do it." After Frank surpassed his Kansas City rival and logged his first 200 hours, the newspaper noted he had others aspiring to his throne: Wilbur Johnson at 2601 Fort St.; Obie Lewis at 1702 Columbus Ave.; Mary Souza at 1708 Webster Ave.; and duo Clover Lewis and Mary Louise Thomas (address not noted). At hour 231, some 15 hours after securing the newest national record, the "volunteer Tarzan" — as Frank had been dubbed by the press — tumbled out of the tree at about 4 a.m. July 26, 1930. He broke his arm — and lost out on his father's promised $1 reward by nine hours. Author Frederick Lewis Allen, in Since Yesterday, his chronicle of the 1930s, wrote of the "utterly fantastic epidemic of tree-sitting," during which thousands of publicity-crazy boys and quite a few girls roosted in trees in the hopes of capturing an endurance record. The result was a series of misadventures, he noted. A Fort Worth boy fell asleep and broke two ribs when he hit the ground. Another boy, in New Hampshire, stayed aloft until a bolt of lightning knocked him out of his lofty nest. Numerous attempts to reach Guinness World Records officials to determine the tree-sitting champ of 1930 have been unsuccessful. Frank, a Waco High 1935 grad, grew up to be a derring-do father to Frank "Sandy" Kellner III. The Hillsboro man noted that his father told the newspaper in 1930 that when he grew up, he'd take up "aviation as a hobby, not a business." However, World War II thrust him into the pilot's seat. He joined the Army Air Corps after Pearl Harbor and began training at Merced Army Flying School in California. The death of another air cadet in a training accident, however, shook him so badly he "washed out" and completed his state-side military service on the ground in the Pacific Northwest, his son said. After the war, the former tree-sitter married Evelyn Burns of Yuma, Ariz., and they moved back to Central Texas, opening the White's Auto Store in West. The family business ran until 1983, when it was re-purposed as Kellner Sports Center and Kellner Real Estate. Frank Kellner Jr., a former West city councilman, died Nov. 20, 1993, at age 76. His wife died in July 2002 at age 84.